Tim Arnot planned a side trip to Venice from Cannes. He roughed out a possible four leg round trip that could be flown over Christmas, on an "as and when" basis, ie not a formal flight. His only stipulation was that if you went, you needed to be back before the Cannes return trip started on 4th January. For full details see Tim's Briefing Document: Briefing Document. Gray Brett provided details for another booze cruise - this time it was for an "Aperitif in Abbeville". To download details see Gray's Briefing Document and FSNav flight plans. Adam Walker organised an event at North Weald. Including a fly in from Le Touquet. Visitors were invited to attend in appropriate World War II aircraft models. The 2-4-CIX team performed a fly past of trainers and of war time aircraft, two of which put on a display. Rich Keen, the VATSIM Airport Manager for Biggin Hill, proposed an event to celebrate the Battle of Britain at Biggin Hill. This didn't come to very much as Rich had PC problems, and had to cancel the event. There were still a few pilots who turned out in WWII aircraft. Gray Brett took us on another trip to France. This time we went from Biggin Hill to Calais. This event proved quite popular, with full ATC cover. More details can be found in Gray's flight plans. Gray Brett & Pete Chapman planned our flight from Shoreham to Alderney on Tuesday 24th July, with departures scheduled to start at 1200z (1300 BST). The route took us along the south coast to Portsmouth, crossing to the Isle of Wight, across the Channel to the French coast, and so to Alderney. Gray provided a selection of flight plans for the intended route. Bill Casey organised his third annual airshow at Sywell, and invited us to open the proceedings again. This year the 2-4-CIX team performed formation fly pasts, with aerobatic displays by a Spitfire, and a synchro pair of Chipmunks. At least that was the plan. Unfortunately, two of our Chipmunks were unable to complete the display. Never-the-less, there were excellent reports from spectators. On completion of the planned display, the Spitfire, piloted by Tony Driver became the Joker, and climbed to hold at 3500 feet behind the crowd. He was called in to fill a couple of gaps between the various displays. We have been invited to open the Sywell IV show next year. Some club members not in the display team flew in to Sywell before the show, adding to the number of spectators - there were 34 parked near the tower when the 2-4-CIX team arrived. Another one of Richards mini-events. This time we went to Caernarfon, North Wales, routing from Gloucestershire, via Shobdon and Welshpool, then across the Snowdonia National Park. There are several places of interest en route, and Richard provided pointers to several web sites for information. Based on details provided by Richard, the Briefing Document was prepared by Tony Driver. The grand opening of the new CIX VFR Clubhouse at Biggin Hill took place on Friday 1st June at 8:30 pm. The new buildings are located close to taxiway Kilo not far from the junction with taxiway Alpha. They include a hangar, a clubhouse, and BBQ site, as well as the normal office facilities. Scenery file(s) containing the new buildings was made available for download from Saturday 26th May, giving time for members to install it on their systems. With the approval of the Airport Manager, members of the 2-4-CIX Display Team did a low level fly past to mark the occasion, breaking into the circuit, and landing to make use of the new facilities. Club members who were not flying with the display team were asked to be parked opposite the clubhouse by 1920z to watch the fly past, and arrival of display team members. Members of the Display Team assembled at Southend, but failed to meet the departure time 1900z. In fact it was closer to 1930z by the time they were ready for take off. Routing was along the Thames to Dartford, and then direct to Biggin Hill, following the normal descent for a straight in approach. The fly past was along the line of runway 21 at 100ft on Biggin QFE. The 2-4-CIX Display Team had a Dress Rehersal of their display which is being prepared for the Sywell Airshow due to take place on 11th July. Members of the team had been practising for some time under the guidance and leadership of team manager Gray Brett. At the same time club members who were not in the Display Team were invited to fly in from one of our two bases in time for the rehearsal. Several members attended as enthusiastic spectators. Feedback provided by these members was very useful, and should lead to a better experience for spectators at the Airshow in July. A trip across the Channel to Le Touquet. 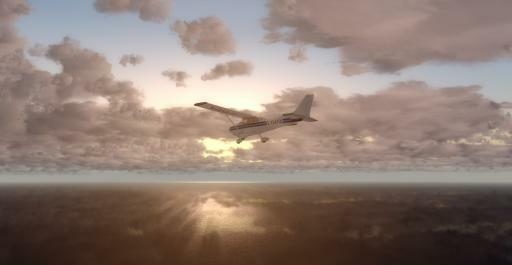 We started from Biggin Hill between 1830z and 1900z routing over the Sevenoaks VRP, and Lydd, then direct to Le Touquet. The distance was just under 80nm - at 105 knots that made about 45 mins flying time. So we got into LFAT 1915z-1945z. Allowing 15 mins to turn around, total time for the event including the return flight to Biggin Hill was about 1 hr 45 mins. We got full ATC cover for this event, including LFQQ_APP (Lille) and LFAT_TWR. There was some local flying, and members of the VBFC were invited to join us. Tony Driver provided an FSNav Flight Plan covering the trip, including LFAC as an alternate airfield. Richard Sinclair's Mini-Events: This was the first of a series of short trips around the UK, suitable for club night flying. Of course you can fly them any time you want. It started from and ended at Bodmin, taking in part of the south Cornwall coast, and a couple of farm strips. The	Briefing Document and FS Navigator Flight Plan to follow the route using FSNav were prepared for Richard by Tony Driver. Richard Sinclair led us on a merry dance around South Wales, starting and ending at Gloucestershire. Richard told us it was not a competitive event, and you could manage without a chart, though you would need to do some navigation, following the directions you were given. A Briefing Document was provided shortly before the event started. The event was so successful that a Post event report was also produced. Pete Chapman gave us a repeat performance without the cryptic clues, which put some people off, making it non-competitive, but still with that edge of mystery - you still didn't know where you were going next until you reached your first given destination, then you were given the next, and so on. This gave other members a chance to enjoy the experience of finding and landing at these very small fields. A third club visit to this interesting unlicensed grass airfield near Basingstoke. Navigation skills needed to be precise, and the landing was quite "interesting" due to obstacles, and an offset approach. The original Briefing Document, was updated to cover our flight from Biggin Hill to Popham. Pete Chapman organised another event for us. We didn't know exactly where we were going in advance, and each member got a different set of clues to follow, leading to different fields. We started and finished at Biggin Hill, visiting six other fields in between - these were mainly farm strips, some of which were developed by Pete himself,	and others from the UK Farm Strips developed by Gerry Winskill.